SKU: 17038. 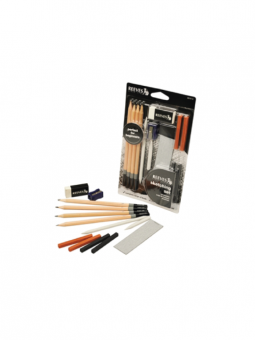 Categories: Drawing & Illustration, Drawing Pencils, Sketching Pencil Set. Tags: kneaded eraser, pastels, pencils, reeves, sketching, Sketching Set. A great set for a beginner or a more experienced artist who want all their sketching equipment in one place. Artist Sketching Set of 13 — This set contains 4 Sketching Pencils (in grades HB, 2B, 4B, 6B), 4 pastels, an eraser, a sharpener, a sandpaper block, a tortillion, and a paper stump.